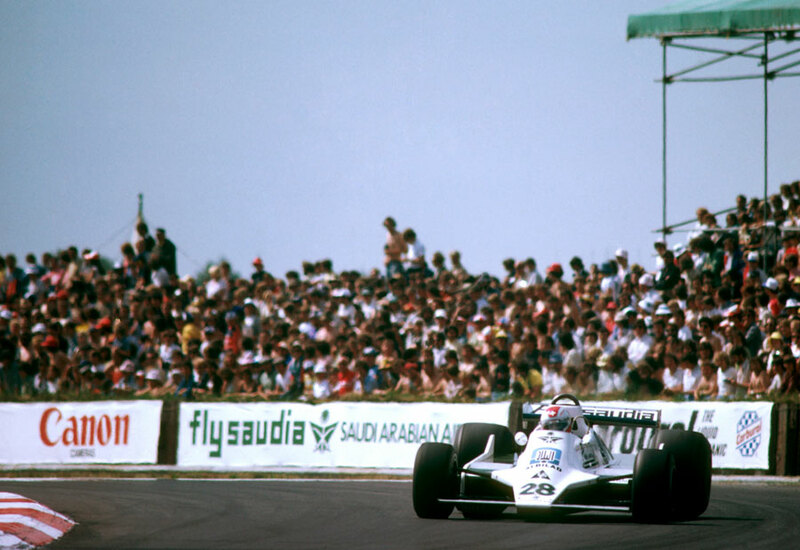 Since the start of the season Williams had been threatening it had a car to reckon with, and Clay Regazzoni, at 39 the oldest man in the field, proved it was no idle speculation with victory at the British Grand Prix. For team boss Frank Williams, his team's success was vindication for ten years of hard slog. The Williams cars dominated the whole weekend, but it was Alan Jones who was the faster of the two, "setting lap times that were as staggering as his superiority over rival drivers" noted The Guardian. Jones led at the start and eased into a comfortable 30-second lead with Regazzoni slotted in behind him. But on the 38th lap a water pump malfunctioned and Jones was forced to retire, allowing Regazzoni to take the victory. Frank Williams had mixed feelings. "I'm delighted for Clay but Alan really deserved to win," he said. "He's put in so much effort into the team and he led the race so convincingly." Regazzoni's podium antics were subdued, standing back as Rene Arnoux and Jean-Pierre Jarier splashed around the champagne. Williams' Saudi Arabian sponsors insisted there could be no association with alcohol and so Regazzoni dutifully sipped lemonade. John Watson, who finished fourth for McLaren, made back-page news after he slammed the behaviour of some drivers. "In the etiquette of our competitive driving some are better than others … but I would put Jarier at the back," he said, claiming the Frenchman had deliberately blocked him several times. James Hunt, commentating for the first time, said on air that Jarier was "pig ignorant"; a description Watson said was "fair". It was a forgettable weekend for the Ferraris whose T4 was not competitive on the circuit. Jody Scheckter was also unhappy with the way the season was developing. "I complained like mad [the team] should keep Gilles [Villeneuve] back. My point was I was leading (the championship) but they were still letting us race each other and we could end up with neither of us winning. But they didn't listen."